This dish is packed with lean protein and skimps on a heavy sauce that is traditionally served with scallops. Instead, olive oil, spices and a small amount of butter (or in this case, Smart Balance made with olive oil) create a light coating and add a ton of flavor. 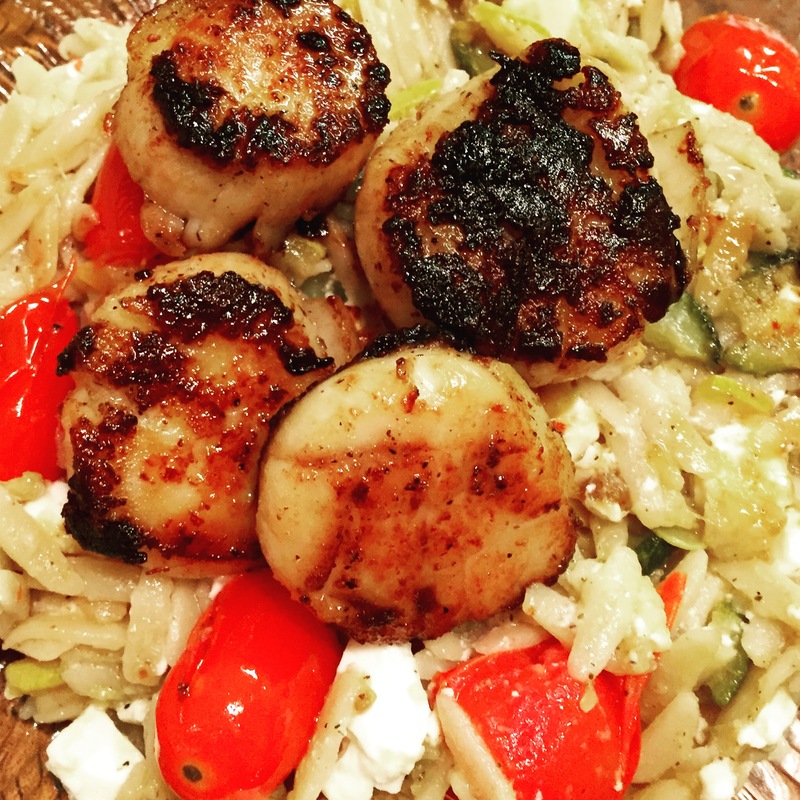 I served my scallops over my whole wheat orzo salad (and made enough for leftovers)! All seasoned and ready to cook! 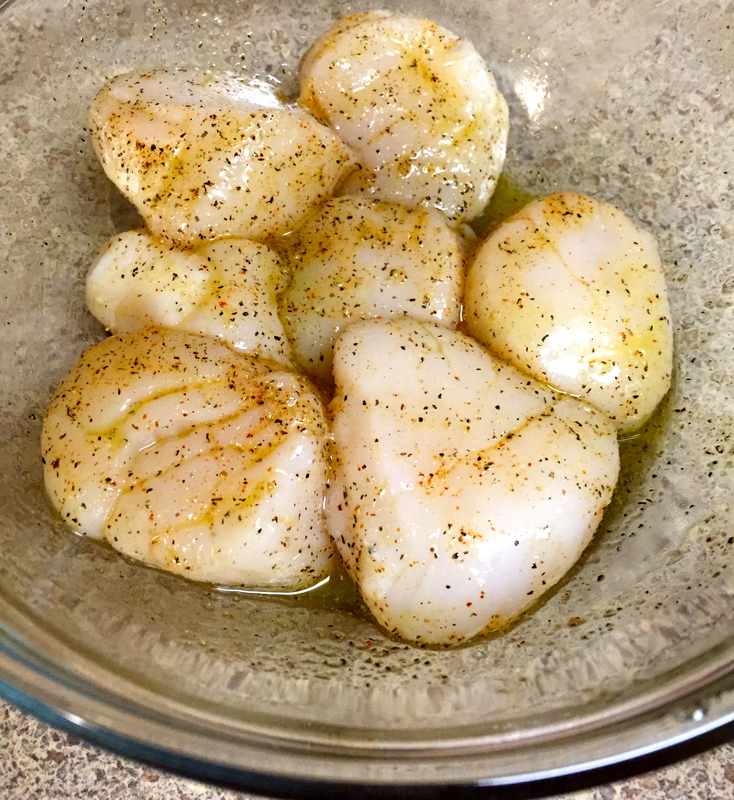 Place the scallops in a medium sized bowl. Add olive oil and spices and mix all ingredients together with a spoon until well combined. Spray a medium sized pan with nonstick vegetable oil cooking spray and warm over medium heat. Add scallops and cook until browned, turning occassionally (about 10 minutes total cooking time, although this may vary). Add butter and stir scallops. 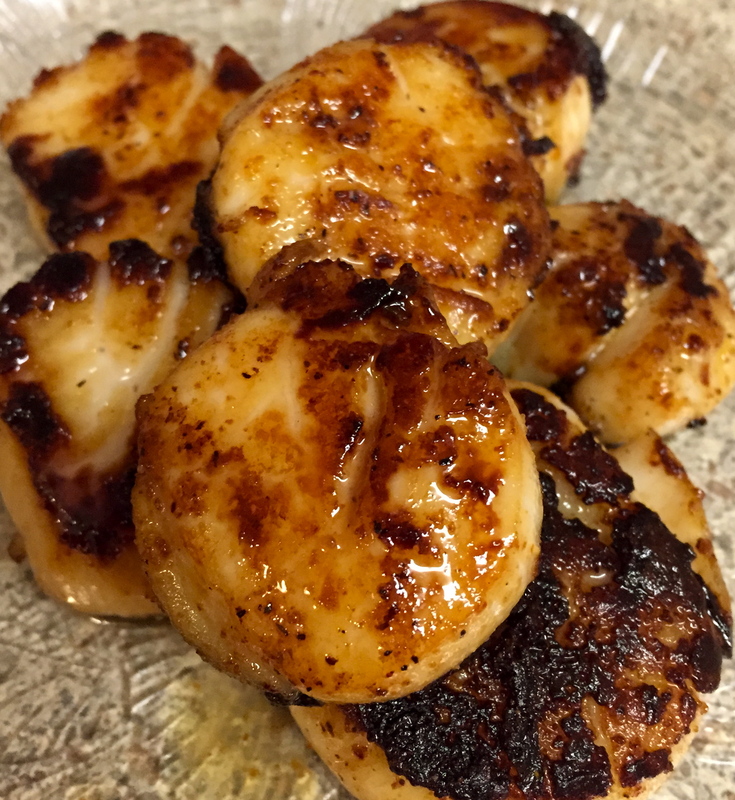 Cook scallops for another 2-3 minutes, until cooked through. Enjoy! seared scallops over my whole wheat orzo salad! 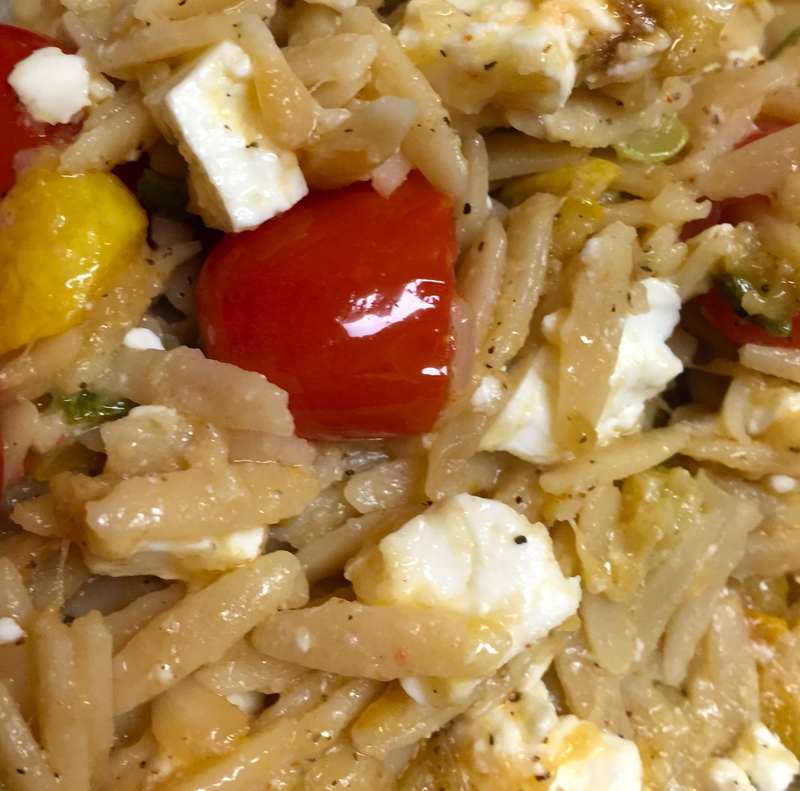 This whole wheat orzo salad is delicious hot or cold and is a great dish to make ahead for the busy week or for entertaining. 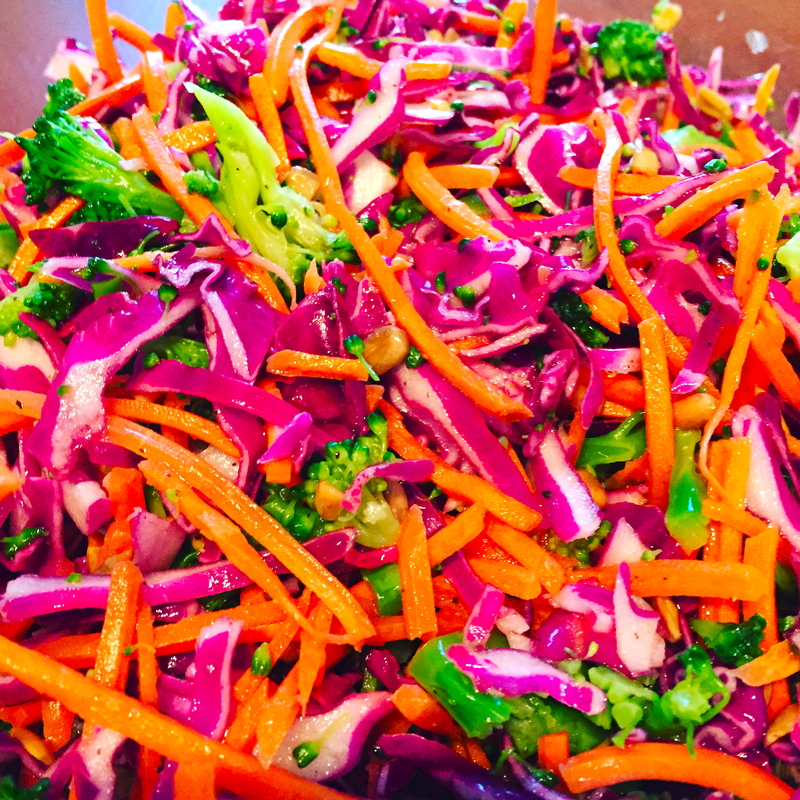 At under 250 calories per serving and chock full of fiber and so many vitamins and minerals, this colorful side dish is a perfect way to enjoy the season’s best veggies while they’re still available! Dice zucchini, yellow squash and onion. Place on baking sheet and add minced garlic, canola oil, cayenne pepper, ground black pepper and salt. Bake in oven for about 25-30 minutes, stirring occasionally. Boil water and cook orzo according to directions on package. 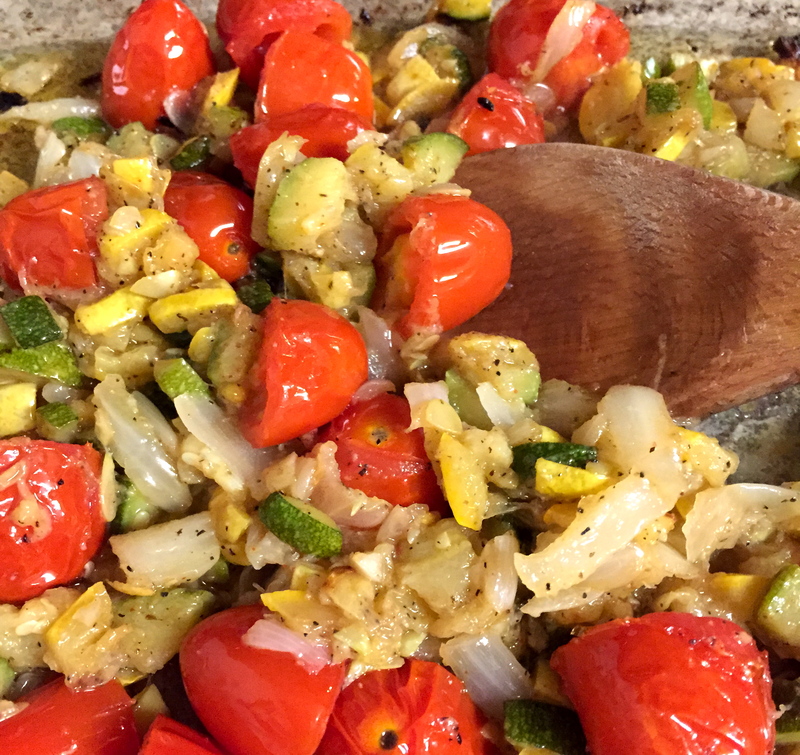 Add tomatoes to roasted vegetables, stir and bake for another 10-15 minutes, until vegetables are slightly browned and tomatoes are softened. Drain orzo once cooked. Add olive oil to clean pot and add orzo and vegetables. Add feta cheese and cook on low heat for about 5 minutes. 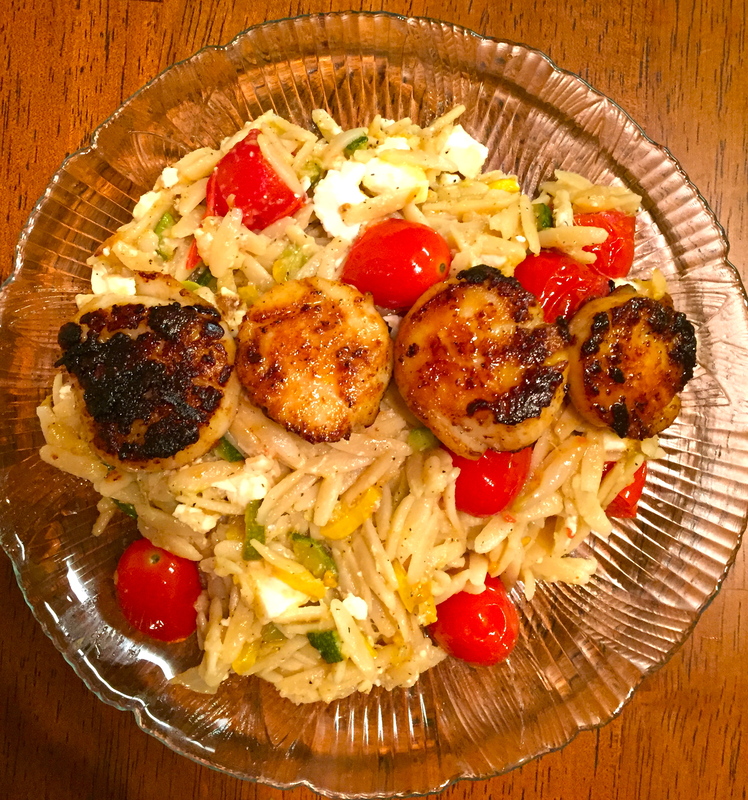 I served seared scallops over my orzo salad! That recipe will be posted on FuelMyFIt, too! This lightened up cole slaw puts red cabbage center stage, and doesn’t cover it up with a thick mayo. Instead, veggies are dressed with lemon juice, red wine vinegar and a drizzle of olive oil and sprinkled with sunflower seeds – rich in healthy, unsaturated fatty acids. It’s a great salad base when topped with a piece of grilled or baked fish, or served as a side on its own! Cut broccoli crown into florets, rinse and steam until bright green and slightly tender (you can steam them over a pot of boiling water or in the microwave – covered – on high for about 1 minute). Remove broccoli from microwave and set aside to cool. In a separate, small bowl whisk together red wine vinegar, olive oil and lemon juice. Set aside. Squeeze broccoli dry with paper towel and chop into tiny pieces. Add broccoli to slaw mixture. Add salt and pepper and pour dressing over slaw. Add sunflower seeds and mix all ingredients. Store in the fridge in an airtight container for up to 4-5 days. This has been my new go-to breakfast for busy mornings – you can make it in about 3 minutes or less, or you can even make it the night prior. Even though it’s bright green, don’t let the color scare you away. 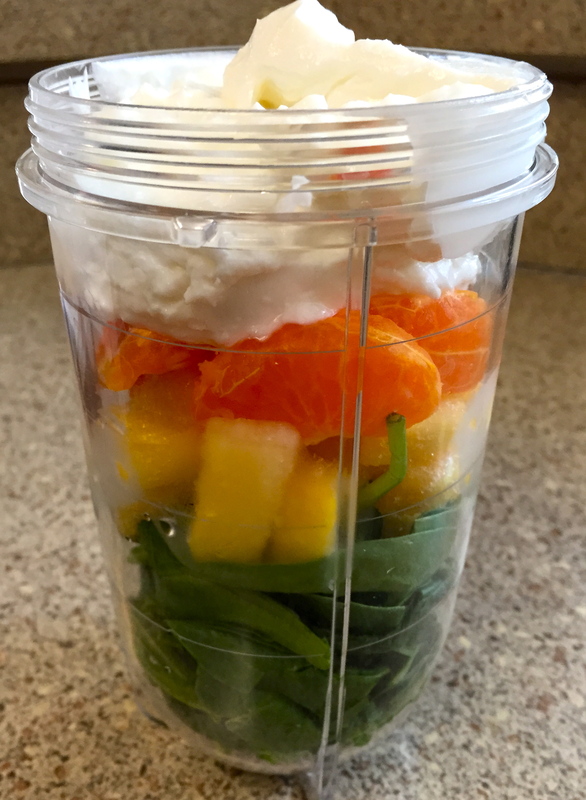 This smoothie is sweet, nutritious and packed with protein and vitamin C. Also, the vitamin C in pineapple and clementine help your body to absorb the iron present in spinach more readily – talk about a power breakfast. 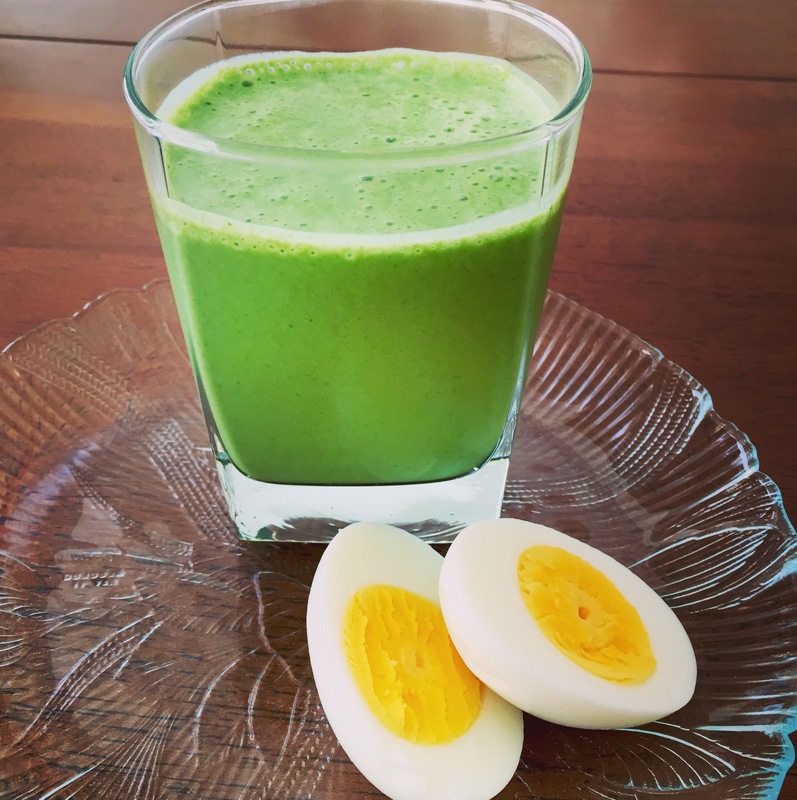 I usually eat 1-2 egg hard boiled eggs or egg whites to increase the protein content, or you can enjoy this smoothie as a mid-day pick-me-up! Place spinach all ingredients in blender (I used my Magic Bullet). 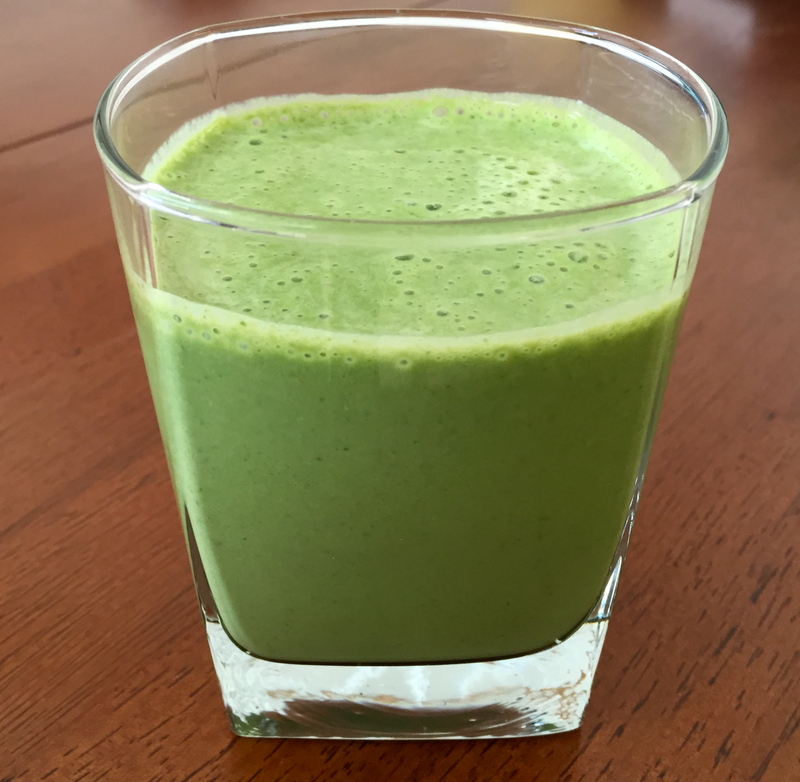 Blend until well combined (you may need to blend it for about 2 minutes in order to get all of the spinach leaves fully incorporated). How easy was that?! *Note: you can make this overnight and store in your fridge to grab on your way out the door the next morning – just keep it covered. This breakfast could be grab-and-go, but it took so little time to make that I just enjoyed it at home! 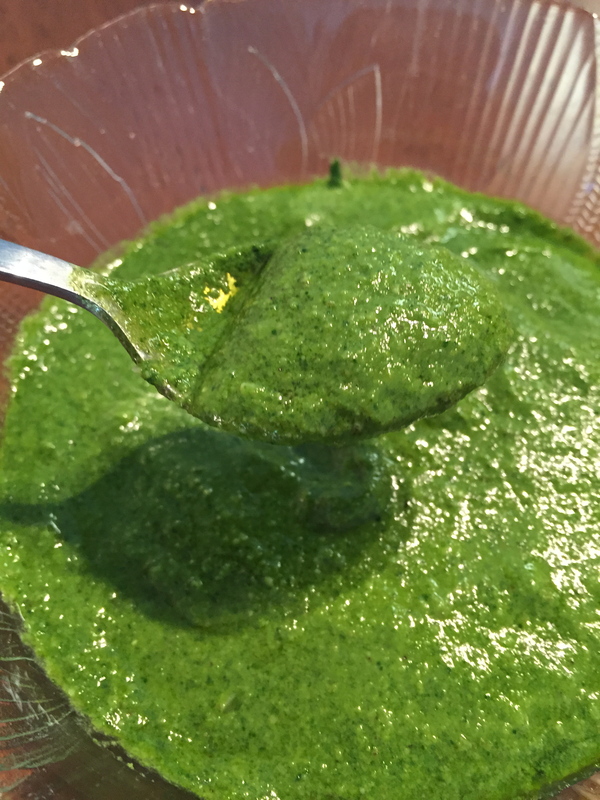 This homemade pesto incorporates the goodness of spinach (which offers folate, vitamin K and vitamin C) along with omega-3 fatty acids from walnuts, which may help to reduce inflammation. While pesto is naturally caloric and a good source of fat, this version is lightened up by using minimal amounts of olive oil and cheese and is lower in sodium than many store-bought brands. I like to make it on a quiet Sunday so that I can have an easy grab-and-go topping for zucchini noodles, pasta or fish after a hectic Monday – it can stay in the fridge for a few days to save some time on days when you are busy. All set to blend together! Wash spinach and basil and pat dry with paper towel, making sure to remove all excess water. Place in food processor and pulse until coarsely chopped (you may need to sweep the sides with a spoon a few times to get all spinach and basil leaves incorporated). 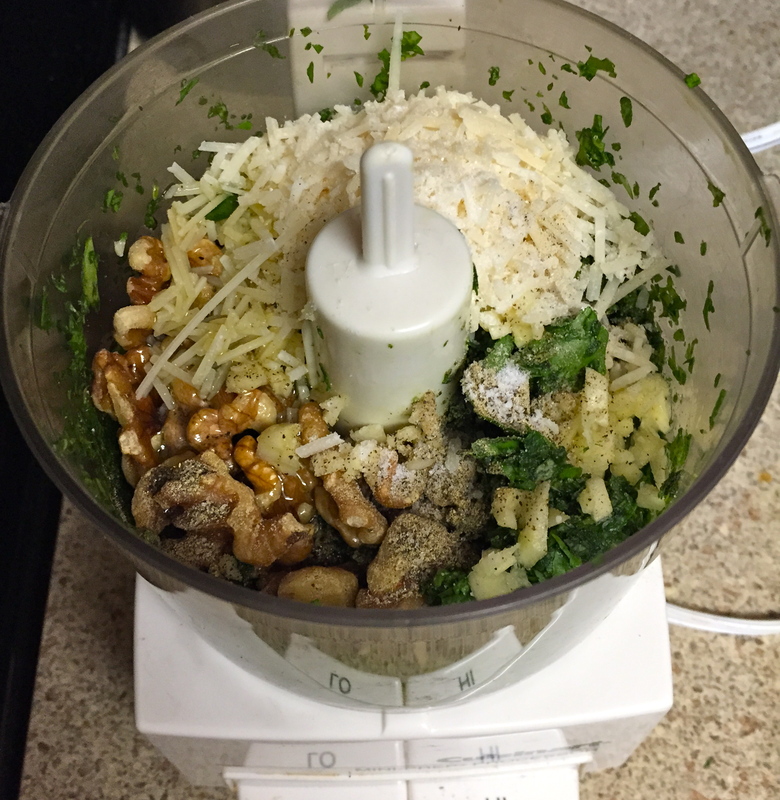 Add minced garlic, cheese, chopped walnuts, salt, pepper and about half of the oil to basil spinach mixture in food processor. Secure the lid and turn the food processor to high for about 1 minute. Add remaining oil, give the mixture a stir, replace the lid of the food processor and continue on high until pesto is smooth. Use as a sauce to accompany your meal or store in an airtight container in the refrigerator for 1-3 days. This spicy veggie dish is a healthy addition to your busy schedule – from prepped to cooked it takes less than 10 minutes! 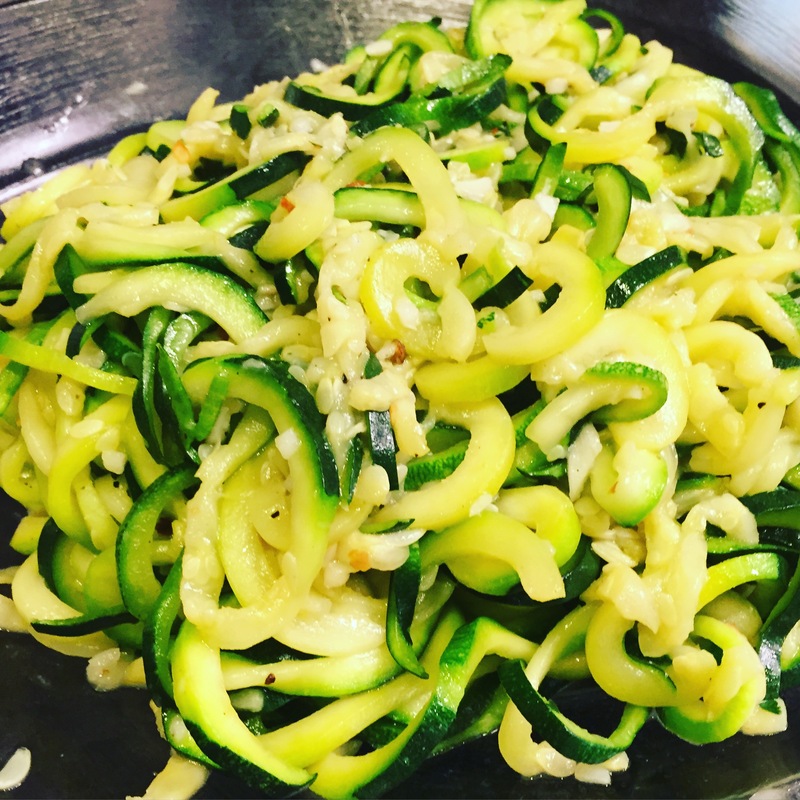 The summer squash is a low-carb, vitamin C-rich alternative to pasta and offers a lighter way to fill up with water and fiber. Serve as a side dish or include lean protein (chicken, shrimp, scallops, etc.) for a meal. Slice zucchini into thin ribbons (I used my Vegetti tool for this – if you don’t have a tool similar to the Vegetti, you can get this effect by using a vegetable peeler to peel the entire zucchini). Pat dry with paper towel to remove excess moisture. Set aside. Mince garlic clove. Set aside. Warm olive oil in skillet over medium heat. Add zucchini noodles with minced garlic. Add spices (salt, pepper and crushed red pepper). 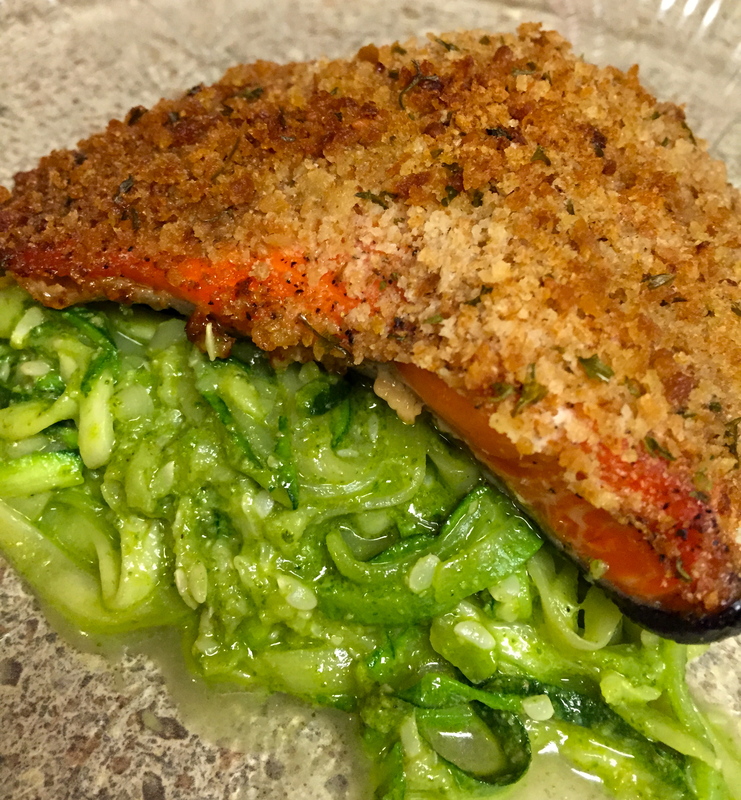 Sauté until zucchini is heated through and slightly softened, but do not let the zucchini noodles become very limp. Stir occasionally. Divide amongst two plates and enjoy!